Silly stuff, and my wallet. I write you this hot and steamy afternoon from the Newark, Delawares' free library. I’m not sure why they call it free, I though all public libraries were free? Maybe they charged at some point and now they don’t! At any rate, I discovered public libraries are a good alternative to parks and campgrounds, whenever I have idle time. On the plus side, they are really quiet and air conditioned with free internet access. On the down side, some woman with cat-eyed glasses keeps making ugly faces at me whenever I sing over my headphones. I assume she is not a Led Zeppelin fan. I guess our taxes are serving a good purpose. Now I feel guilty not paying them all those years. Just kidding! My Delaware gig was sidelined for the day due to one of the bosses’ wife going into labor last night. It’s been another interesting gig, and you’ll read about it when we complete it tomorrow, on the gigs page. Since I’m not doing much, I decided to write about another side story. I received the scare of my tour so far, and it had nothing to do with a gig. When I arrived in the state on Wednesday afternoon, I decided to stop at the local GNC for some vitamins, on my way to the campgrounds for the evening. Nothing unusual happened at the store, but I exited with my hands full of the purchases, my keys, phone and wallet. Now there are three things I always make sure I have with me and cannot afford to lose at any point, so far from home, my cell phone, keys and wallet. I jumped in the truck and headed for the KOA. Three miles down the road I took inventory, as I always do, and didn’t feel my wallet in my side pocket. Sudden panic filled my entire body! I quickly searched the trucks seat and counsel before the light turned green again, nothing. I hit the gas once it did and made a u turn. I immediately stopped on the shoulder and scanned every possible nook and cranny I figured it could have possibly fell into, as it sometimes does. Nothing. Now I’m cussing in Spanish! I knew then that I had probably dropped it when I unlocked the door manually, back at the shopping center parking lot. Now I have extra keys stashed in the vehicle and my phone can be replaced, but losing my wallet would be a disaster. License, debit and credit cards, S.S. card being the most important. If you’ve ever lost a purse or wallet, you know the hassle it requires to replace all the articles lost. Especially for me and it would definitely paralyze my tour for a few days or longer. I jumped back in the Gigs mobile and raced back! Three miles felt like thirty, especially now that the world seemed to go in slow motion with every city block I travelled. I got all the lights red, of course and everybody in front of me was moving way too slow. If I was from this side of the country, I would have worn out my horn! I knew it wasn’t too far, but I knew that it would only take a minute for someone to spot it and scoop it up. Every minute counted! I finally reached the main boulevard, but the shopping center was still on the other side of the medium that divided the streets. Feeling the pressure to reclaim my goods, I impulsively jumped the medium like a big monster truck in a rally, before the other side turned green! Surely all the commuters saw me and shook their heads, especially if they saw my Arizona plates. Desperate times call for desperate measures indeed. I hooked a right turn and pulled up right where I had been parked not fifteen minutes earlier. And there it was, still lying where I had apparently and carelessly dropped it in my haste to get going. Whew! What a relief. My stomach was in my throat as I stooped over to pick it up. I was so relieved that no one saw it there in the open. 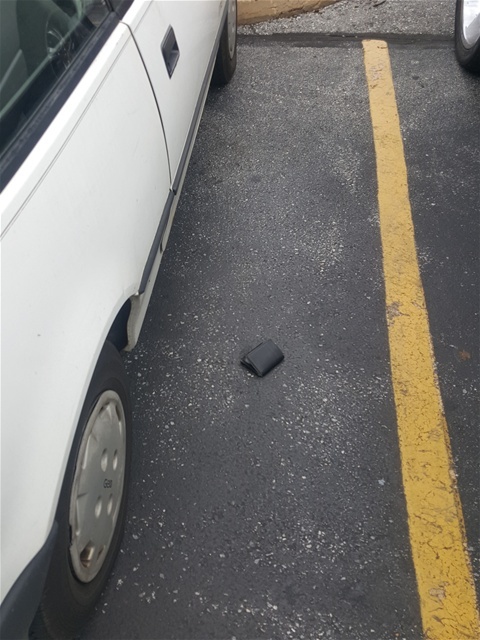 A black wallet on black asphalt helped disguise it a bit I concluded. I drove back to my intended destination still reeling from the emotions and shock of what could have been if someone had actually found it before me. It still makes me shutter of the possibility. Once I set up my camp and sat to relax, I thought of my reckless behavior on the road back to the scene. I felt somewhat guilty, but under the same circumstances, I don’t know how else I would have reacted. I grew a few more gray hairs with that episode and I hope I don’t repeat it. I truly do try to take a lot of precautions with every aspect of this adventure, but sometimes s*#@ happens, to everybody. So that’s my story, one I will never forget. Next time I have some free time I want to talk about road kill. Only because I scored my first victim last night, in Glasgow, De.